So I bought a new car? Come the end of June I was faced with a dilemma. A dilemma that everyone who owns a car faces at some point in time. Do I keep my aging vehicle with unforseen maintenance costs or replace it with something newer. I did a rundown of the costs for keeping my 2008. I took a considerable amount of time something newer or get a new / newer one. KBB Value for the 2008 was about $9200, with an annual depreciation of $500 per year and additional losses as mileage increases. Once over 100k miles the resale value plummets around 16% / $1500 compared to current day. After 6 1/2 years, a squeaky brake pedal, rattles, a bunch of scratches, a bumpy ride, no Bluetooth and mediocre 25mpg MPG. So I started doing research. I was very close to getting Mazda 3 hatchback, but the lack of incentives, distance of the dealerships from my home and road noise were all concerns. Our Honda Accord is not much fun to drive, KIAs aren’t built well, Toyota reminds me of old people, I don’t trust GM, VW reliability is still sub-par and the premium makes are either bad on gas or I can’t afford them. So I decided to get a newer version of the vehicle I owned. Spoke about it with my boyfriend, told him and the dealership the trade-in value would heavily influence my decision to buy or get car fixed. In 2008 I traded my 2003 model for $6000 and saw the car online for $10k. All because of timing and letting emotions grab the best of me. 2. I picked last years model year. 2014 vs 2015. The ’15s are almost identical yet a few thousand more. The car I bought is one of the best MPG non-hybrids for its class. 3. I researched the dealership. It had the best reviews in the DFW area. I was satisfied with the experience. Was probably the lowest amount of stress I have ever experienced buying a car. Some of the tactics dealers pull are downright offensive and unethical. 4. Got a price quote from edmunds.com before I went in the door. 5. 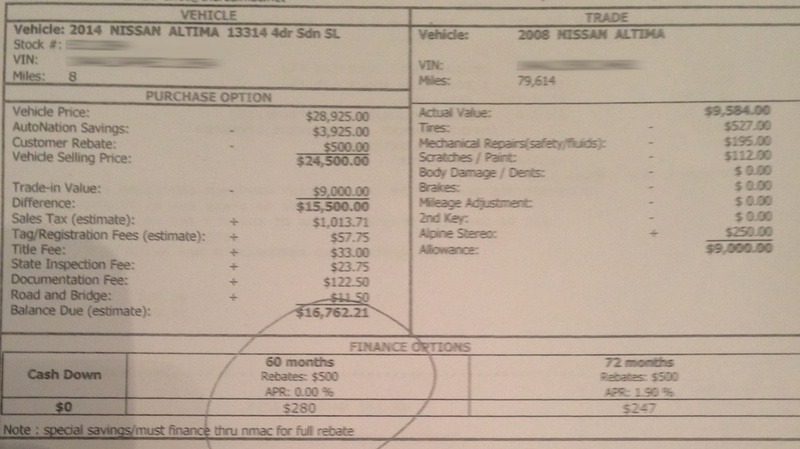 Negotiated to get the 0% off and have dealer go up on the price $1000 instead of the $1500 that I would have lost. 6. Made sure I got a good deal on my trade. $9000 plus the savings from not having to pay sales tax. This exceeded my expectations and lowered the amount of what I financed significantly. I love the way the car drives and handles. I can see myself keeping it 7 years. Didn’t buy an extended warranty on it yet, but have 3 years to make that decision. I didn’t really want to buy a new car, but think now was as good a time as any to do it. Will post more but that’s my quick update. Congrats on the new “baby.” Good idea to wait until the very end of the quarter, I need to remember that next year before i move to the west coast and have to buy a car or scooter.